Two weeks ago I saw this tweet. This really interested me as a journalist who writes about UGC and the power it can have. Most people who consume news and media now follow and comment events on twitter, we have written about this in relation to the Xfactor on #Xfactor and BBC Question Time on #bbcqt. But the revelation that the Editor of Newsnight has a twitter feed in the gallery and uses real time feedback to cull tanking guests really impressed me. As avid reader of this blog you will know we still have something of a trust issue with UGC so we decided to put it to the test (after contacting Newsnight but getting no response). 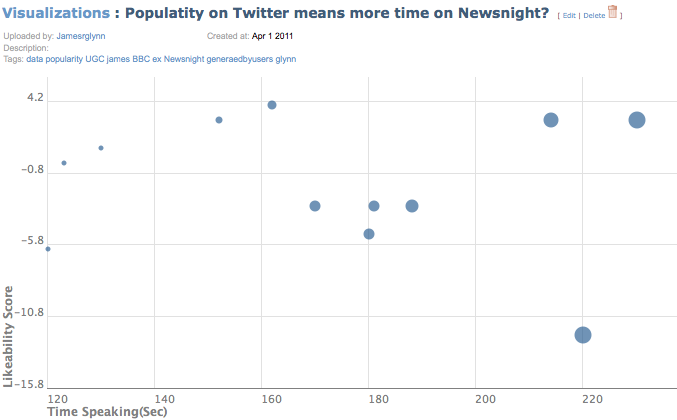 We watched Newsnight and set up a twitterfall feed with the search #Newsnight, so far so scientific. We then timed how long each guest spoke for and how many positive or negative comments they or the debate that they were having got on Twitter. We then subtracted the negative comments from the positive comments and so each guest receives a single +/- figure. For example. Shaun Bailey received 3 negative comments and no positive ones so he gets a score of -3. We did this on two dates Tuesday 22nd March and Thursday 31st March as we thought it may be slightly more scientific and then we put all the data into a table then a lovely graph thanks to Many Eyes – to see the fully interactive graph click here. So what have we learnt from this albeit it entirely unscientific experiment..
1. That we need more data to make more of an accurate reading. 3. Guests that are hovering near the 0 likeability scores are actually getting less time..therefore boring means less screen time. It seems that that the initial tweet was right if a guest is tanking i.e boring then they get less screen time! The POWER of UGC is very much alive! Here are some tweets from John_Crooks when Noman Bentoman, Hisham Matar and Mike O’Brian were talking and they all got amongst the shortest time as they didn’t provoke debate. Aside from the very many factors that can change. Guests it seems are likely to be dropped if they are dull and get no reaction not bad reaction, after all a programme like Newsnight is all about debate. 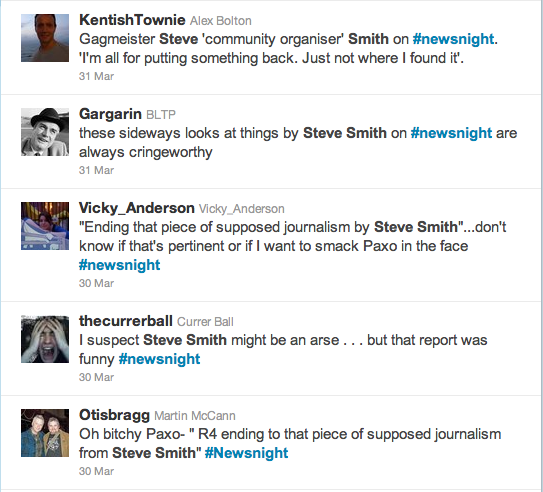 As a side note the biggest reaction on Twitter was for a package on the Big Society by Stephen Smith, whose whimsical style seems to have rubbed most viewers up the wrong way..
No chance of that being dropped then..
A couple of weeks ago I wrote a post about an online community for gypsies and travellers called Savvy Chavvy. It got me thinking about the influence, and to a certain extent the power, of mainstream media. In some ways entertainment media these days can seem to be even more powerful than the news, which in the past, represented many people’s main source of news and information. Today there is a whole new generation who consume news and media in an entirely different way… Infotainment. That is to say information combined with entertainment. This is a fun and interesting medium to gain news and information from, and with some 9 million viewers it’s definitely popular. The problem however, is when the entertainment factor begins to overtake the information factor. I believe we have seen this in “documentaries” like Channel 4 ‘s Big Fat Gypsy Weddings. Dare I call them ‘mock-umentaries’? They are interesting and new, but surely they cannot be compared with a traditional journalistic documentary. What I have found from research on many social networking sites is that these programmes generate a great amount of conversation and online. 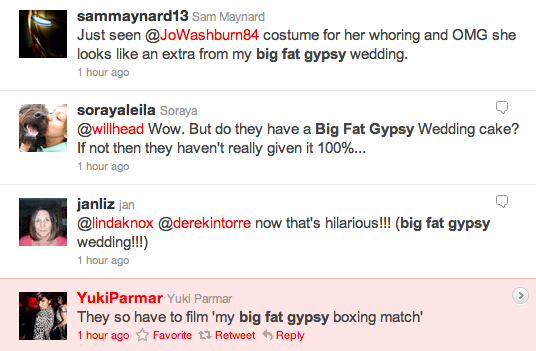 If you #BFGW there are references not only to the programmes themselves but to an entirely new social reference. This reference from what I have gathered seems to be on the whole quite negative. Many people are beginning to associate negative, laughable, and stereotyped behaviour with the gypsy way of life portrayed on the programme. The problem is that this programme is not representative of all traveller and gypsy communities. By creating a programme so dedicated to entertainment over information, C4 have created an extremely entertaining show, but a show that may have pigeon-holed an entire marginalised community. These people are not happy about this as can be seen from the outbreak at an RTS meeting yesterday.. The people in marginalised communities, now when I say marginalised I don’t just mean gypsies and travellers. We’re talking about prisoners, ex-prisoners, disabled people etc… are starting to use platforms to have their side of the story heard using user generated content. At the beginning of 2011, the social media site Facebook is used by more than 600 million people across the world. Not only is it one of the most frequently used UGC sites and can be a veritable fountain of information for journalists, for example being invited to events or groups of interest, but it also proves to be a good subject for media in its own right. Tonight MTV will be showing the “Diary Of Facebook”. 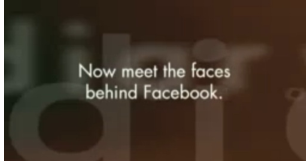 Its a documentary that will expose the inner workings of lives of Facebook and the employees that work there. The documentary includes interviews with Mark Zuckerberg the head of Facebook, talking about the culture of the company and how it has progressed. It has become so popular that the behind the scenes workings of the company are of interest to the general public. Let us not forget the phenomenal success of ‘The Social Network‘. The film was based on the creation of Facebook by its founder Mark Zuckerberg. ‘The Social Network’ received critical acclaim and was one of the biggest films of the year. It is has won four Golden Globes, an Academy Award, four Critics Choice Awards as well as many others! As this form of UGC became so popular and such a massive financial and commercial success, it shows that UGC should not be limited to giving ideas and contributing information to a story. It surely is a matter of time before we see a ‘Twitter- The Movie’. User Generated Content can be a useful medium for all types of journalism. All mainstream news companies provide excellent internet sites, that are linked to Twitter and other social media platforms. Their content relies on polls, videos and content that the wider public uploads. One aspect of journalism that relies increasingly on social media and UGC is entertainment journalism. There are thousands of bloggers and UGC members who contribute to entertainment journalism. Below are two case studies that utilise UGC in different but equally successful ways. 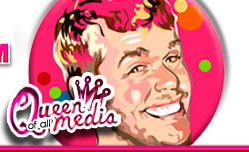 Perez Hilton is the ultimate entertainment and celebrity blogger. He has built his career on his website and the infamy it generated. Within the first six months of Hilton’s blogging career, his first blog PageSixSixSix.com was named “Hollywood’s Most-Hated Website” by Us TV program The Insider. As of April 2009 PerezHilton.com was ranked as the 491st most trafficked website on the Internet (143rd within the US) according to Alexa, the subcompany of Amazon.com. His infamy has been built on the UGC input on his blogs. Relying on his network of sources of personal contact but also tips given to him by the public via his internet sites. He is dependent on the UGC input to his website for his success. His success has become so monumental that he has branched into mainstream international media, including a slot on Radio 1 and on British TV, see the video below! Hollyscoop is is an online entertainment magazine focusing on Hollywood media, celebrities, fashion, and “Hotspots”. 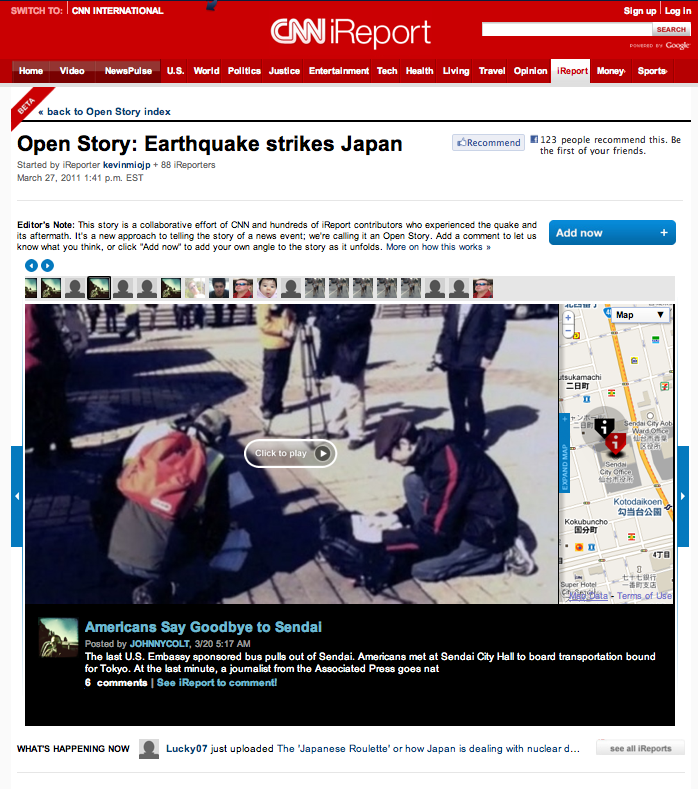 Hollyscoop provides a good example of UGC and sourcing information for entertainment journalism. 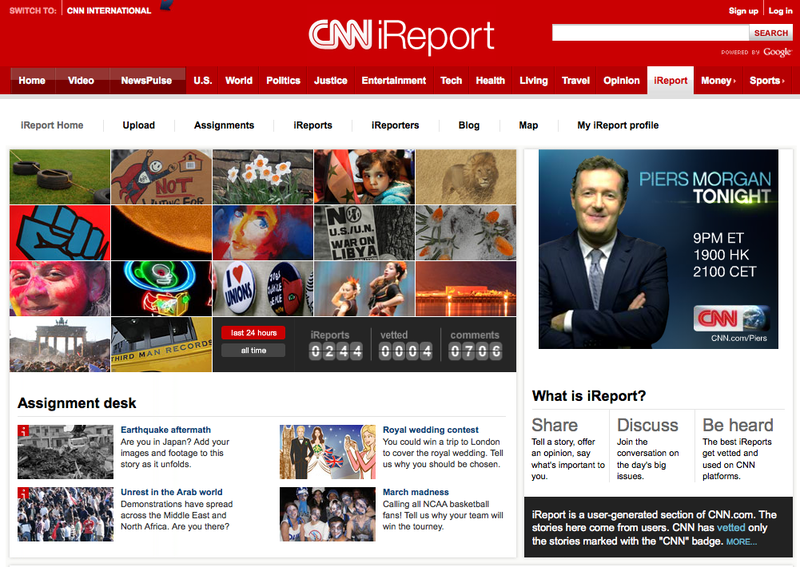 It provides up-to-minute breaking news and exclusive stories, directly from the source. It is also updated 24/7, bringing readers from around the world fresh international content daily. It also commits to a wide variety of UGC sites, promoting itself and its brand across all social media and online community. It has its own Website, a feed on Twitter, Facebook, MySpace, and multiple channels, including channels on Blinkx, 5min, Vimeo, and Youtube. Hollyscoop has reached across so many online platforms that they are able to get interviews from all the top celebrities as you can see from the video below. Both these internet entertainment institutions use UGC to their advantage. Building the online networks they depend on and utilise they have built successful careers as entertainment journalists. The impressive scope of their online networks and the publicity they gain from it show how useful UGC can be to a journalist. 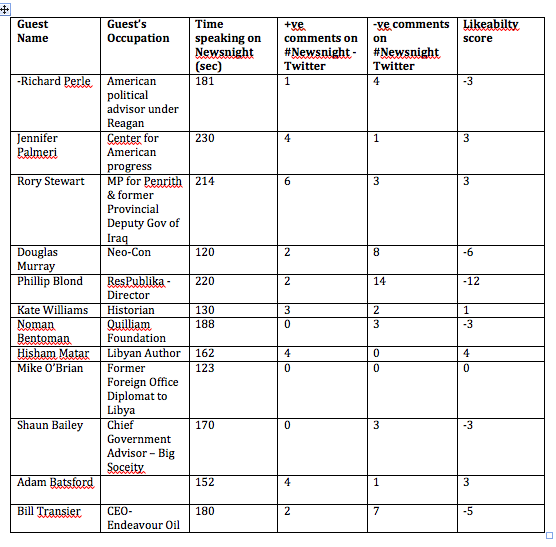 Last month The Independent Newspaper published their list of 100 Top Tweeters. To see who made the top 100, click here. The Independent’s list does present a helpful list to those working in the media and those interested in UGC. The list breaks with tradition as it doesn’t place their primary focus on numbers of followers (although they do consider popularity), but also content, interactivity with followers and social impact of their Tweets. This is a welcome change from the usual polls that publish lists of the ‘top tweeters’ that comprise of vacant celebrities. Their Top 100 is comprised of a wide strata of the public world, not just the Katie Price celebrities of the UK (although she does rank in at number 89). Those who made it into the top 100 Tweeters included politicians, comedians, broadcasters, journalists, scientists, activists, authors and musicians. The very first person listed is Sarah Brown, wife to ex-Prime Minister Gordon Brown and is called by some “the first lady of Twitter“. She seems notable as she heads the list and rightfully so. Hailed by The Independent as ‘an unexpected pioneer of the medium’ her case seems to show the triumph of Twitter. While she was mocked when she first began Tweeting, and her Tweets are often rather dull. Yet through her endearing nature and her campaigning work that she publishes on Twitter, she has grown incredibly popular. Her interactivity with her followers also commends her as a top Tweeter, an important aspect of any UGC forum. The Independent argues that ‘she is now more listened to than her husband’. This seems an amazing achievement when she has based it all on her User Generated Content of Twitter. Using her experience in PR to create such a successful online identity, inviting her husband to guest edit for the day, increasing her following by a thousand. While her Twitter account does not reveal any opportunities for journalism, it does provide an excellent case study for how to manipulate UGC to the best possible capacity. If a woman who has nothing of particular wit or breaking news can reach the top of a list like this, posting about family walks and the generally mundane then it seems that UGC can be accessible, and useful to everyone and anyone! In case this is your first time here get yourself up to speed by what we mean by User Generated Content.